When we play music, we hold some of the notes for a longer duration than others. This combination makes the music much more interesting to listen to. The composer and/or performer of the music is the one that decides which notes get to be longer or shorter. When we notate music we will therefor need different notations to represent the different lengths of notes. The same goes for the breaks where we don’t want any notes to be played. The performer needs to know how long to wait before the next note starts. These different notes and rests are indicated using a variety of notations. There are four beats that make up one measure in Common or 4/4 time. 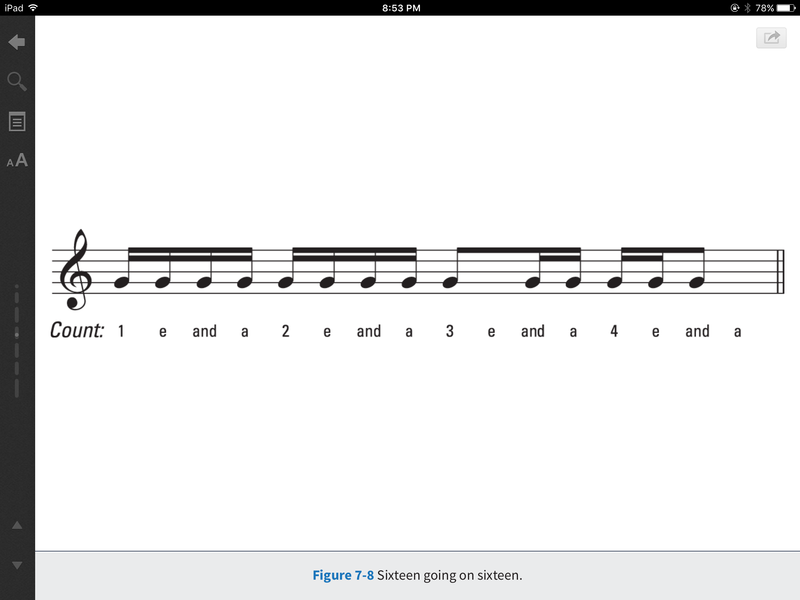 These four beats are notated with something called a quarter note. The quarter note has a solid note head with a long stem. This is one of the most common notes you find in music. 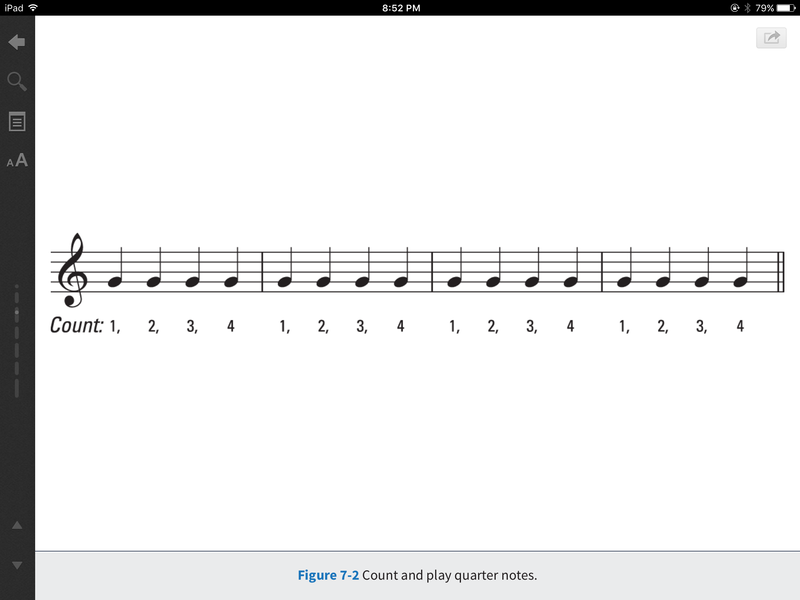 Try playing the quarter note Gs above on the piano while counting the four beats out loud. 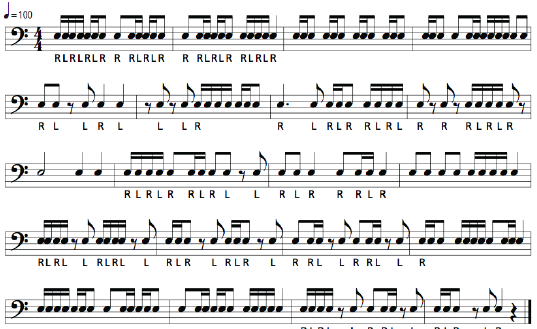 Half Notes: half the measure or two beats. If you cut a pie into four equal pieces you will have four quarters. If you happen to eat two of those quarters you will have eaten half the pie. Therefor two quarter notes are equal to a half note. Notice below that a half note is made up of a circle note head with a stem. Try playing the G’s again while counting and be sure to hold the half notes for two full beats. Whole Notes: the whole pie! If you eat all four of the pieces of pie you cut up you will have eaten the whole pie. The whole note is written using an open circle that is kind of shaped like an oval. Try once again to play the whole notes below while counting the four beats out loud. Make sure you keep the G going for all four beats. OK now lets put all the pieces together and perform the following music using a G on the piano while counting out loud. When you divide in half the quarters of the pie you end up with eight pieces. 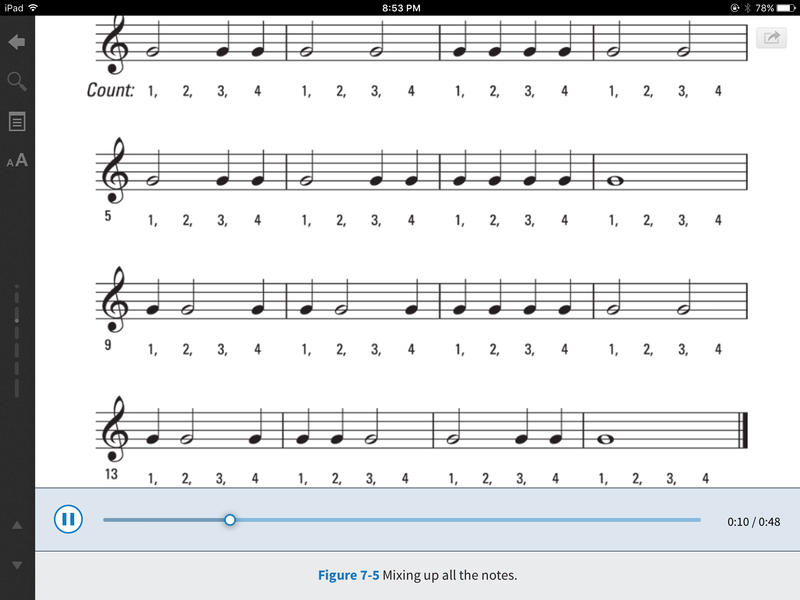 So two 1/8th notes take up the same space as one quarter note. Therefor two 1/8th notes get one beat of the four in a measure. 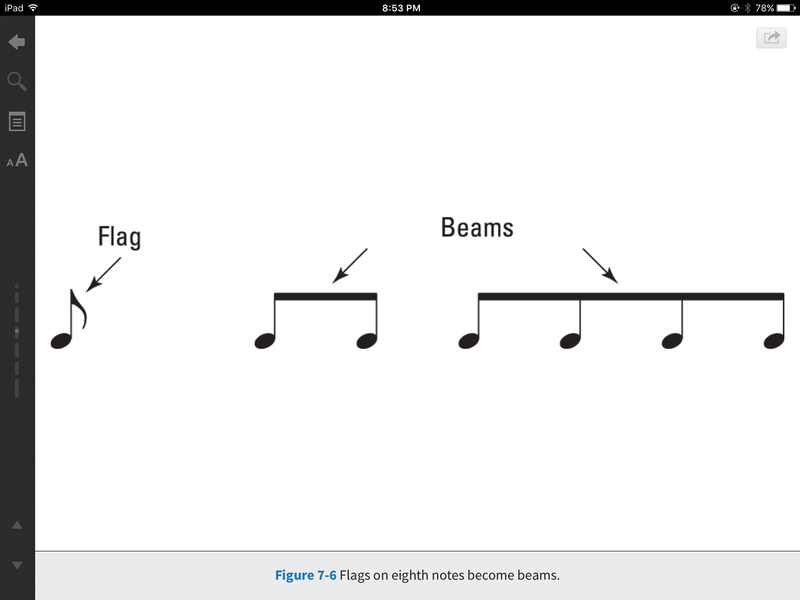 Eighth notes are written with a solid head and a stem with a flag on it. 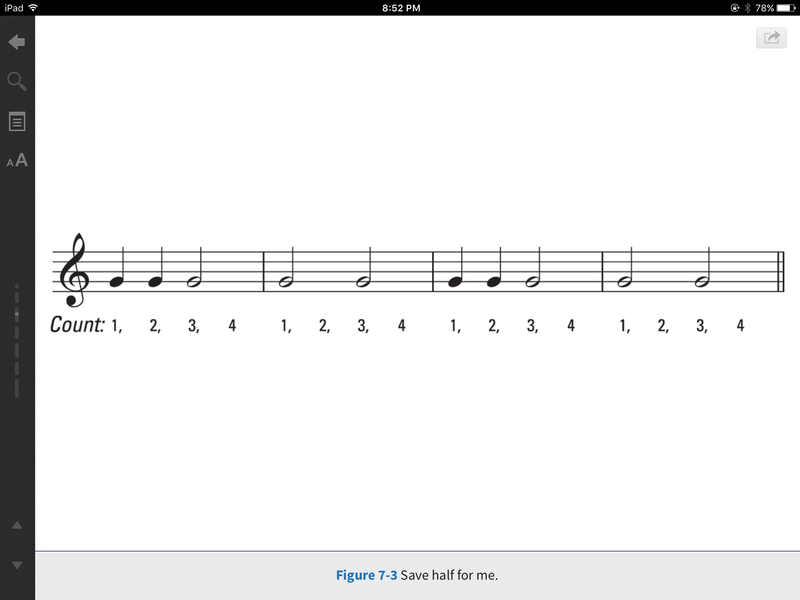 If you are writing multiple 1/8th notes in a row we join them or beam them in groups. This helps make it easier to read during performance since it is easier to visualize the beats. To make counting easier when playing try counting 1 & 2 & 3 & 4 &. This will help to keep a steady tempo and to keep them all the same even length. Try to play this while counting the eighth notes out loud. If you divided each quarter up into four equal parts you would end up with 16 pieces of pie. Now if you ate four of these pieces you would have eaten a quarter of the pie. 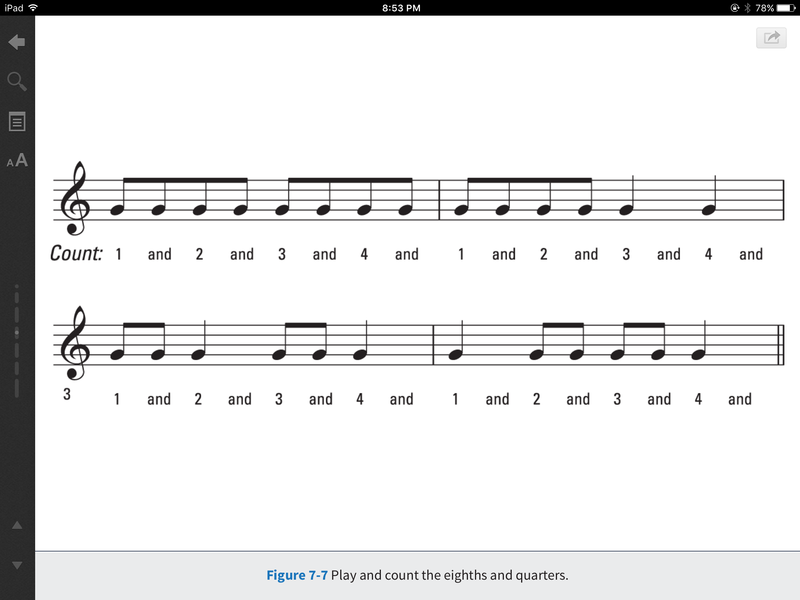 To make it easier to count and keep the beat with sixteenth notes we add a few extra syllables to our count as follows. Now try playing the Gs below in the appropriate rhythm while counting sixteenths out loud. Sometimes composers want the music to have even more notes crammed together in the same amount of time. The next value is double again or 64th notes. They go quite fast since you need to play twice as many in the same length of time as a 16th note OR 64 of them in the same beat of a 1/4 note. 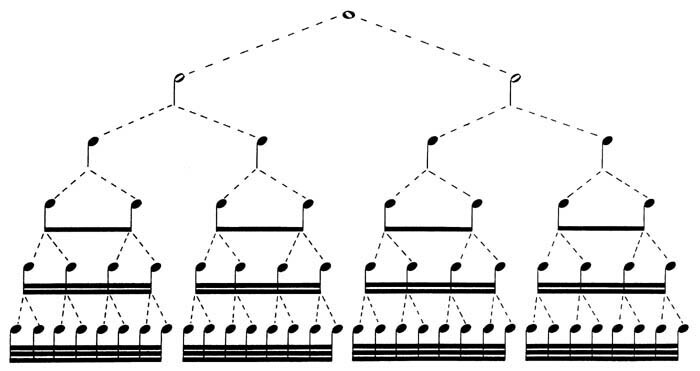 Here is a chart which shows how a whole note can be split up into smaller pieces. You can use any combination of note values in one measure of 4/4 time but the value of notes added together for the whole measure has to equal the whole note value.